Marie White was born to write, but it would take one horrific event to send her into full-time writing. Her entire world was upended when her youngest child was abducted. In her grief, she began to pray about what to do with her life. In answer to her prayer, she heard a podcast announcement that missionaries were needed, so she trained and became a missionary with Global Media Outreach. Within the first few months, she had spoken with over 300 converts to Christianity in countries all over the world. Another purpose was born in educating Christians who had converted as adults, so there was a gap in knowledge of the Bible. To help people learn quicky, she started a YouTube channel and “Bible Stories for Adults” was born. Marie’s first attempts at recording were a struggle, with a shaky voice and bad video that she did herself. As she put it, “I was practically hyperventilating.” Though she initially kept the series a secret, it didn’t take long to catch on and quicky had over half a million views. Through this work, Marie realized she had much more to do. She began work on a book to teach others some of the things she had learned about God’s goodness. That book, Ten Day Bible Study, became an Amazon bestseller, which has now been translated into modern Greek and is being used by missionaries in Greece. Next she wrote a book for anyone that wants a better life, Changing Your Life in Just Ten Days. Over 10,000 have read this book via Amazon, Barnes & Noble, Smashwords, iBook and Nook. Marie began to understand and view other people’s pain differently and she noted the very high rate of suicide and homelessness within the LGBT community. Using a strict set of standards for biblical accuracy, she wrote God’s Love for LGBTQI, offering comfort, hope and love to those within the LGBT community. The next project Marie created began as a how-to for families trying to survive the loss of a child through abduction, divorce, running away or being taken into foster care, but evolved into a comprehensive survival guide for parents, Strength for Parents of Missing Children: Surviving Divorce, Abduction, Runaways and Foster Care. Marie has been featured on The Huffington Post, Fox10, The Arizona Republic, K-Love, the Promise fm, Restoring Families and Shine 104.9, to name a few. When she’s not writing or spending time with her family, Marie enjoys hiking, knitting and talking to people who are inspiring others. 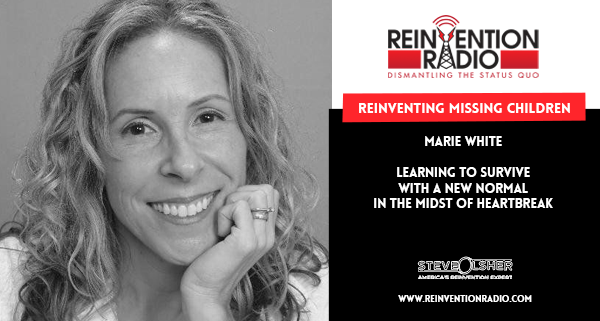 TUNE IN to this episode as Marie chats with Steve, Mary and Richard about missing children, and learning to survive with a “new normal” in the midst of heartbreak. 2 – What she did in the wake of the abduction; How could you be doing videos when your child was missing? ; Finding strength from your interior; How did God allow this to happen? 3 – Were you ever a suspect? ; How do you let your other kids out of your site? ; Son, I would rather you be embarrassed than abducted. ; What she would say to the abductor right now. Reinventing Life’s Choices – In this episode, Dave Kehnast chats with Steve and Richard about life’s choices, and coaching people towards “impossible” futures for themselves.